"Just got confirmed for France in October! Going on our 3rd tour overseas. Pretty lucky folks, we are!" CMB will make sure to take many pictures, send back video feed and keep in touch through our website and Facebook page. Come out to the 63rd Annual Bucking Horse Sale 2013 when The Copper Mountain Band performs the opening act Thursday May 16th, 2013 at 6:30 PM. in Miles City Montana. Billy Bobs at Disneyland Paris! 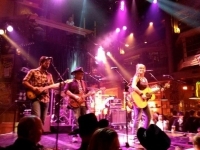 Check out a video of Copper Mountain Band performing at Billy Bobs in Paris, France!